Review of City Municipal Gallery & Fine Arts Venue: Collection, Exhibitions, Artists Shown, Opening Hours. One of the longest established public visual arts resources in Ireland, Limerick City Gallery of Art offers a range of painting and sculpture via both its Permanent Collection and its contemporary program of temporary art shows. Along with the Limerick Art Society (Ireland's oldest art society), and the National Self-Portrait Collection, the Limerick City Gallery of Art is an outstanding cultural resource both for the City and County of Limerick and its visitors. The Gallery's own Collection, begun in 1936, features artists from the eighteenth to the twenty-first century. Through the Collection one can trace trace the history of Irish art in drawing, painting, sculpture, photography and contemporary media. 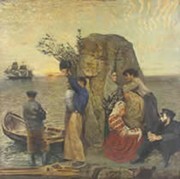 Highlights of the Permanent Collection include works by famous Irish artists like Paul Henry, Sean Keating, Jack B. Yeats and the sculptress Dorothy Cross. In addition to its own collection, the Limerick City Gallery of Art houses the National Collection of Contemporary Drawing, featuring a diverse assembly of works that challenge and expand our concepts of artistic draughtsmanship. As well as displaying (in rotation) its two collections, Limerick City Gallery of Art also hosts numerous temporary exhibitions, featuring works in all different media including drawing, painting, sculpture, lens-based art, installation and new media. Previous exhibitions have included work by artists like, Diana Copperwhite, Michael Minnis, Jack Donovan (a retrospective), Tom Fitzgerald (drawings, sculpture and installations), Amy O'Riordan, Tina O'Connell, Tjibbe Hooghiemstra, Helena Gorey, Jill Dennis, Caroline McCarthy, Michael McLoughlin, Brian Kennedy, Helen O'Leary, Joe Duggan (photography), as well as Japanese art and a photographic celebration of the Ukrainian City, Dnepropetrovsk. In addition to its regular program of contemporary cultural exhibitions, Limerick City Gallery of Art stages the annual ev+a show, Ireland's foremost annual exhibition of modern and abstract art. Established in 1977, EV+A is centred in the Limerick City Art Gallery on Perry Square, although its artworks are installed in numerous other venues throughout the city. Like the Crawford Art Gallery in Cork, the Limerick City Gallery of Art places great importance on its education program which seeks to raise the level of art appreciation and understanding throughout the city and county. Numerous art projects are organized throughout the year for schools and the general public, with a focus on Irish painting and Irish sculpture.  For more about galleries in Ireland like Limerick City Museum & Art Gallery, see: Irish Art Guide.